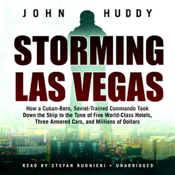 STORMING LAS VEGAS by John Huddy (unabridged) is presented by Blackstone Audio and comes with what is perhaps the best audiobook app available (see FEATURES, below). On September 20, 1998, a Cuban-born former Red Army lieutenant named Jose Vigoa launched a series of raids on the Las Vegas Strip. During a sixteen-month spree, Vigoa hit five world-class hotels, three armored cars, and one department store. The casinos were: the MGM; the Desert Inn; the New York, New York; the Mandalay Bay and the Bellagio. Lieutenant John Alamshaw, a twenty-three-year veteran in charge of robbery detectives, was ordered to stop the robberies at all costs. He knew he was up against a mastermind. What he didn’t know was that he was running out of time. NOTICE: This app includes the exact same 5-star recording offered elsewhere at much higher prices. It was professionally recorded by Blackstone Audio’s Audie®-winning narrator, Stefan Rudnicki. You are not buying yet another amateur or volunteer narration. No clicks, background noises, throat clearing, mispronunciations, tinny voices or monotones will be found here. •EXPERIENCE. About 13.5 hours of narration. Created as a Folium enhancedAudio™ edition, this book includes extra functions and features not found on lesser players. RATING: Suitable for adults interested in a real-life Las Vegas heist story.